July, 1830. On the ten-hour sail west from the Hebrides to the islands of St. Kilda, everything lies ahead for Lizzie and Neil McKenzie. Neil is to become the minister to the small community of islanders, and Lizzie, his new wife, is pregnant with their first child. Neil's journey is evangelical: a testing and strengthening of his own faith against the old pagan ways of the St. Kildans, but it is also a passage to atonement. For Lizzie -- bright, beautiful, and devoted -- this is an adventure, a voyage into the unknown. She is sure only of her loyalty and love for her husband, but everything that happens from now on will challenge all her certainties. As the two adjust to life on an exposed archipelago on the edge of civilization, where the natives live in squalor and subsist on a diet of seabirds, and babies perish mysteriously in their first week, their marriage -- and their sanity -- is threatened. Is Lizzie a willful temptress drawing him away from his faith? Is Neil's zealous Christianity unhinging into madness? And who, or what, is haunting the moors and cliff-tops? I didn’t love Island of Wings and I didn’t hate it. I was interested enough to continue to see what happened and at times found it horrific and fascinating but overall, I’m just not sure this novel was for me. 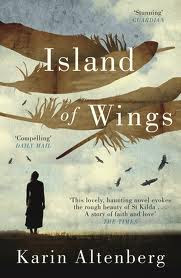 Island of Wings is a historical novel about the Island of St Kilda, the inhabitants and a Reverend and his wife who are posted there to guide the ‘savages’ into modern life. Based on real people, the novel is a fictitious account of their life there, with historically accurate events and details. Religious fanatics don’t appeal to me in any way, so the Reverend’s quest for redemption didn’t keep me reading. Instead, I loved his wife’s story. Lizzie’s plight among people that she couldn’t communicate with and who lived a completely foreign life to her with an increasingly distant husband was intriguing. I kept wondering what I would do in such a situation and with limited resources and in a time that a woman wasn’t able to make bold moves regarding herself or her family. Her loneliness was palpable and heart wrenching and I enjoyed watching her initially try to cope and eventually understand the natives more than her husband who was trying to lead them. The relationships she cultivated with the other women was heart warming and there was one scene in particular that actually had me giggling and yet another gagging. The pagan superstitions and rituals were fascinating and I found the attempts of the Reverend to crush them both irritating and amusing when unveiled how entrenched they were to island life. The mysterious deaths of babies on this island broke my heart many times over and the entire way through the novel I wanted to know why. I was finally rewarded in the notes and acknowledgements, so if you’re interested in why the neonatal rate on the island was so high, keep reading. The details and description of the Island were both gruesome and fascinating. They lived on such barren land, yet the inhabitants somehow managed to survive. The details of all the birds eventually blended together for me, with the exception of how the islanders survived winter and the stench which was described many times over and actually had me gagging in certain instances. There were really long passages in this novel which I tended to grow cross eyed at and I had to check early on that St Kilda was a real place and where it was located as for some reason I apparently missed it. But that said, there was enough in Island of Wings to maintain my interest and keep me flipping pages. Thank you to the House of Anansi Press for our review copy. All opinions are our own.